Understand how to optimize your website for local online and foot traffic in 2015 with our local SEO marketing tips and tools. As the algorithms for Google and other search engines keep evolving to provide more accurate results for visitors, the question arises: How can you get a leg up on the competition? The answer is simple — Local SEO. Local SEO isn’t just optimizing your website for local traffic anymore. Search engines have gotten smarter to help eliminate keyword stuffing and get more accurate results. In July of 2014, Google came out with a new algorithm called Pigeon. Pigeon places a new, higher emphasis on localized on-page SEO as well as the uniformity and accuracy of local citations. With these new developments, establishing strong local SEO value for businesses with multiple locations is more important than ever. To help your multiple locations gain more foot traffic and online traffic in their respective local areas, you have to optimize your local SEO. For companies and websites who have a local presence, it’s important to include any NAP (name, address, phone number) information so that it is easily accessible and visible on your website, page title and other onsite SEO. By including this information, you’re placing a higher emphasis on location and tying it to your company and website. Pigeon now looks at the location of your stores in relation to the geography of the city and distance to the center of the city. Having all of these unified will help when it comes to improving your local citations. Just when you thought the Yellow Pages were dead and useless, Google proves us wrong again. One of the biggest changes within Pigeon is the emphasis on local citations. While not the most important factor, this had one of the biggest jumps in importance from last year. By claiming and owning all of your citations, you can control the information that is listed on these citation pages. The last factor is similar to the second, and equally as important. 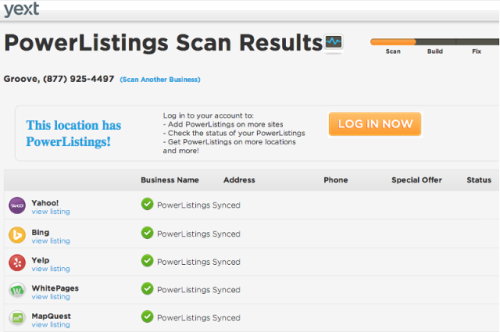 Once you’ve claimed your listings, updating and maintaining these listings is vital. Having consistent information on the citations across the Internet plays a big role in your local rankings. Search engines cross-reference your NAP information to help validate the legitimacy of your business, so make sure it’s consistent across different channels. For example, you wouldn’t want your Yelp page to have one company address while Foursquare has a completely separate location. Claiming and maintaining every citation across the entire Internet can take a lot of time and effort. There are two tools we use here at Groove for our clients to help claim and keep citations accurate. Yext is a tool that we’ve recently started utilizing that helps you easily claim citations across the Internet. Yext has partnered with over 50 citation websites and you can update all 50+ of these citations with the click of a button. There are many additional features that come with a Yext subscription, such as adding calendar events, bios, products and more to each citation. You can even go to their site right now to ‘Scan Your Business’ for free to see how your business currently appears across the Internet. It will show you the information that is provided for each listing, as well as tell you what information is inconsistent or missing by highlighting it in red. Groove's power listings are currently green, meaning all information is consistent in all fields. Moz Local does something similar by sending your company’s information to the big data aggregators, who then distribute the information to different citations. Both of these tools are great options to help improve not only the presence of your citations, but also boost your website’s visibility. Now you have the knowledge and tools to start optimizing local SEO for your business! Interested in learning more about how Groove can you improve your local SEO marketing? Contact us today! We’d be happy to help.